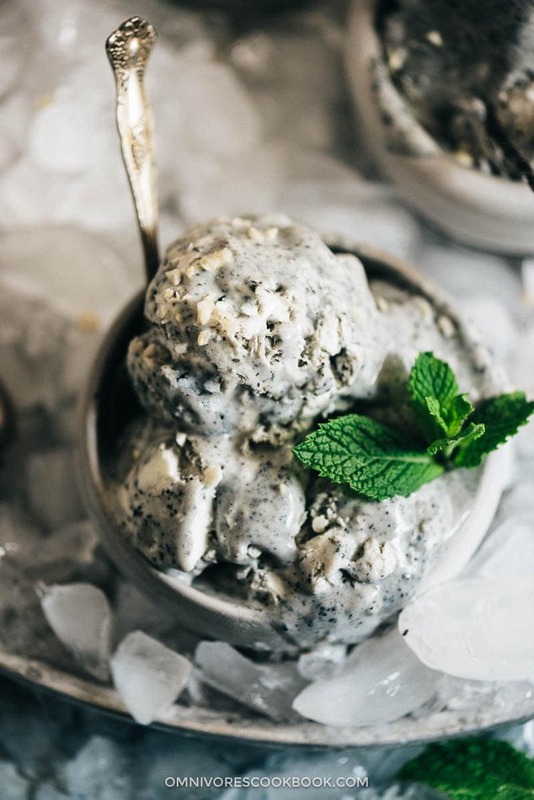 Nutty and creamy, this super addictive black sesame ice cream only requires 4 ingredients and 5 hours ‘til it’s ready. No ice cream machine needed! 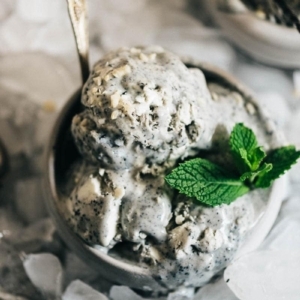 Raise your hands if you love black sesame ice cream as much as I do! It is one of my must-have desserts whenever I visit an Asian market. The only problem is, our Asian market is so far and we make a trip about once a month. 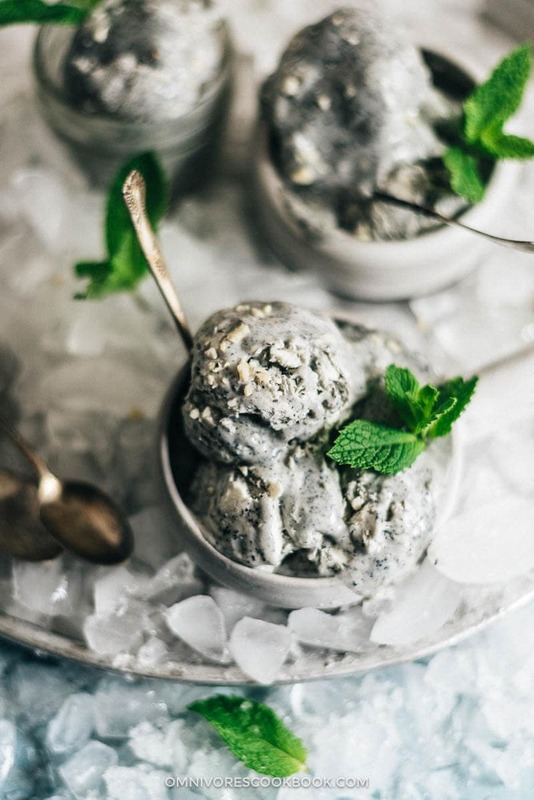 That’s why I decided to find an easy black sesame ice cream recipe to make at home, to curb my summer craving! 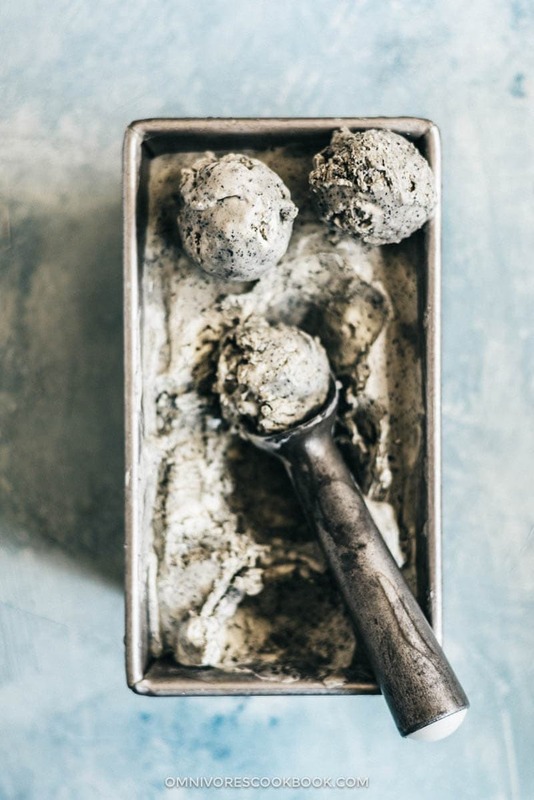 Traditional black sesame ice cream not only requires a ice cream machine and a long ingredient list, it takes 1 to 2 days ahead to freeze the ice cream properly. Recently I’ve learned a secret to create no-churn ice cream from Food Network. The no churn ice cream works like magic. It only requires two ingredients – sweetened condensed milk and heavy cream. And your ice cream will be ready in as quick as 4 to 5 hours. 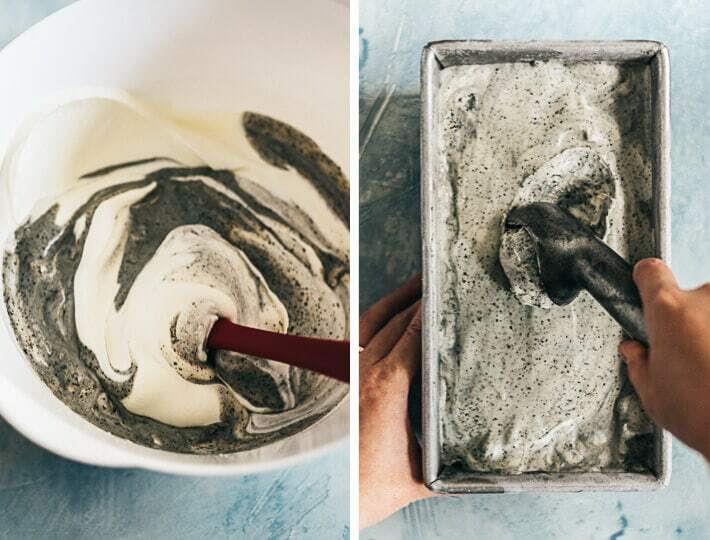 I used this method as a base to create this black sesame ice cream and the result was beautiful. Toast black sesame seeds with low heat until they sizzle and smell very fragrant. Grind them in a food processor until oil starts to seep. The mixture will become a bit sticky and almost like a paste. This step will make sure we thoroughly release the flavor of the black sesame seeds. Add condensed milk and vanilla extract to the black sesame seeds, and blend them again. Beat heavy cream until a peak forms. 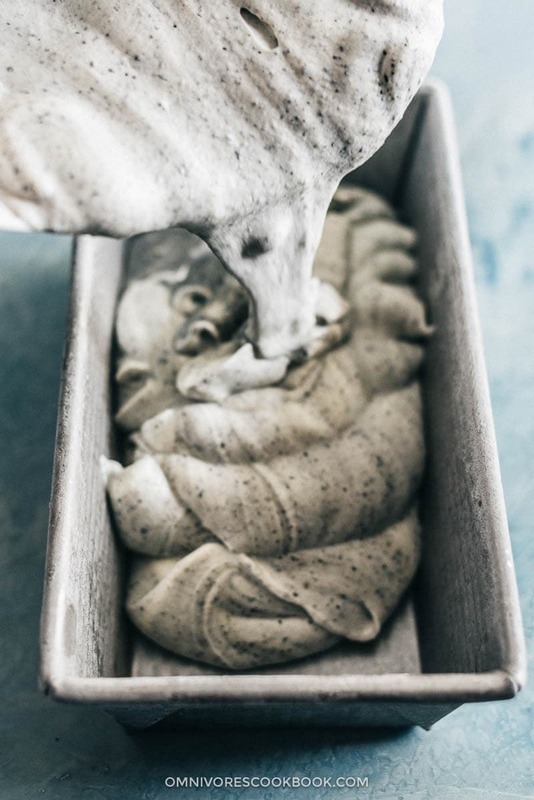 Fold it with the black sesame mixture. Pour into a loaf pan. Freeze for 5 hours and enjoy! The ‘cooking’ looks so easy doesn’t it? Here are some extra tips to make your ice cream taste even better. Ingredients such as white chocolate, macadamia nuts, or oreo cookies add great texture to the ice cream. Pick out one ingredient you love and chop it into small chunks, then fold it to the black sesame and condensed milk mixture (between step 3 and 4 of the recipe below). Some of my favorite garnishes include toasted black sesame seeds, crushed peanuts, or fresh mint leaves. Fresh berries are great options too. 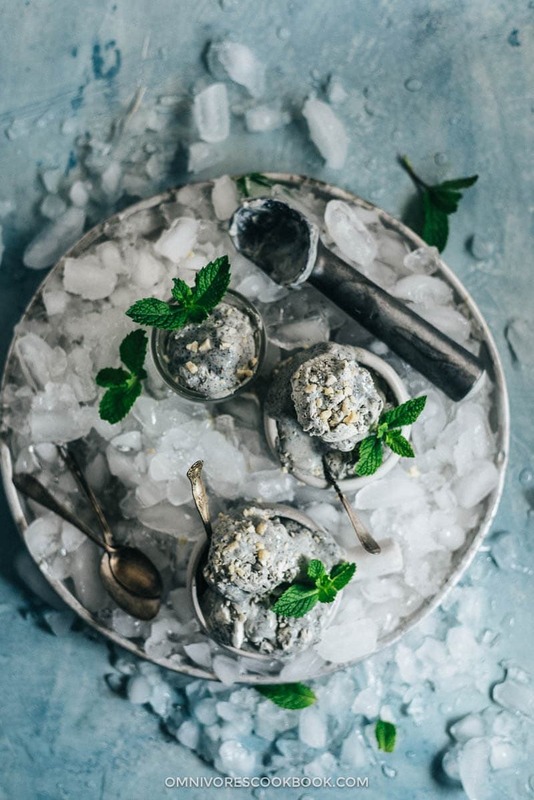 Serve the black sesame ice cream on a snow cone for a fun party dessert. Or serve it on a waffle to make a scrumptious Sunday breakfast! Chill a 6-cups volume loaf pan or baking pan in the freezer. Add sesame seeds in a medium-size skillet and toast over medium heat. Stir occasionally until you can hear a gentle sizzle if you lean towards the sesame seeds, about 5 minutes. Turn to low heat and toast for another minute, or until you smell a strong nutty aroma. Transfer to a big plate to cool for 5 minutes. Transfer the sesame seeds to a food processor. Mix until it just starts to form a paste. Add condensed milk, vanilla and salt. Mix until everything is combined. Transfer to a big bowl. Add the heavy cream in a large deep bowl. Whip with a mixer on medium-high speed, until it forms firm peaks, about 2 minutes. Transfer about 1 cup of the whipped cream into the condensed milk mixture. Fold with a rubber spatula until just combined. Then transfer the lightened condensed milk mixture into the whipped cream. Fold until just blended. Pour into the loaf pan. Cover and transfer into the freezer. Freeze until the ice cream turns solid, about 5 hours. Love black sesame ice cream! So refreshing and delicious. Have you ever tried making this with milk alternatives? Will have to sort that out so that we can enjoy this this summer! BTW congrats on making the top 100 Asian Food Bloggers list. Well done! Pinned! Thanks so much for sharing and have a great day! God, how interesting. It must be so delicious. Made it yesterday, so easy and turned out perfectly, great recipe thank you. MAGGIE, I’M SO EXCITED TO FIND A EASY RECEIPE FOR THIS. JUST A QUICK QUESTION, WHILE ITS FREEZING DO I NEED TO PUT ANY PLASTIC WRAP OVER IT? Hi Jessica, you don’t need to put a plastic wrap over it when you freeze it. Although if you plan to store the ice cream in the freezer for a long time, covering it with plastic wrapper will prevent the ice cream from absorbing other odor from the freezer. Can I use whipping cream instead of heavy cream? It is quite difficult to buy heavy cream in Malaysia. TQ. hi ! can I use ready packed black sesame powder instead of seeds? I don’t own a food processor. Great taste, very easy, but after a whole night in the freezer it is still just creamy, not solid. What did I do wrong? I want to use it for ice cream sandwiches but it is too soft. Any suggestions? will try putting it in my churn. Thank you for the recipe. I wasn’t sure how much toasted sesame seeds to add to get a good flavour. How many tablespoons of black tahini if I’m using? Hi El, you can use 6 tablespoons black tahini to replace the sesame seeds.